Jacket with gold buttons, textured with faux leather, shirt with attached faux leather vest, velvet like red sash, faux leather boot covers. Also includes faux leather hat with a feather. 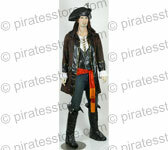 Size (adult) SMALL: Chest 36" - 38", Waist 30" - 36", Inseam 33"